I love foods from all over the world, but I’m pretty clueless about Indian cuisine. My one experience at an Indian restaurant was in New York City many years ago, where I was served very dry, very spicy grilled chicken. It didn’t thrill me. Recently, I spotted a recipe that looked like something I could handle first time around: “Indian Cooking 101,” if you will. It uses the traditional 2-step tandoori process of marinating: first, with the spices and then with yogurt for tenderizing. 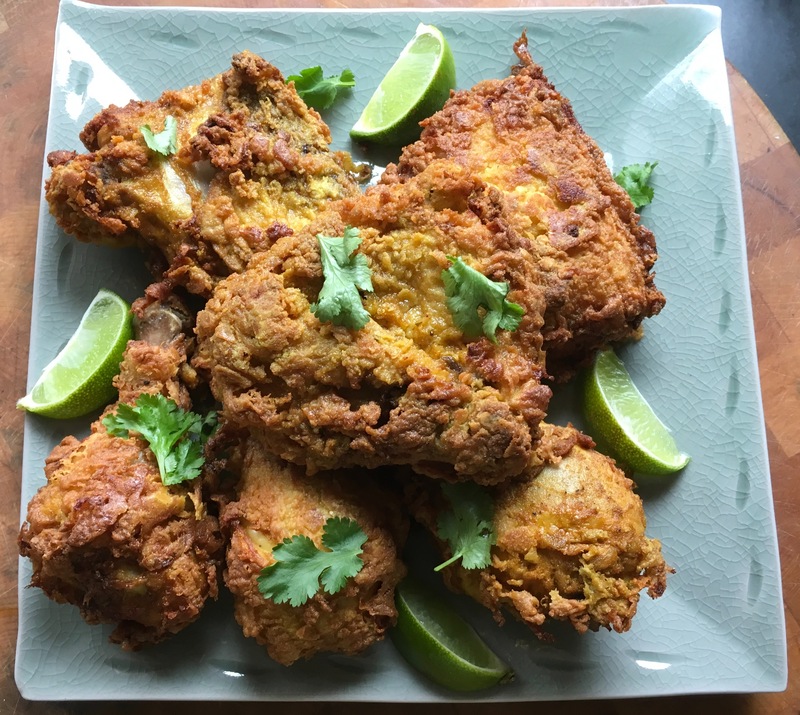 Using chicken thighs and drumsticks (as opposed to breast meat) meant the chicken would be flavorful and juicy. And frying in oil meant a crispy skin. I was ready! 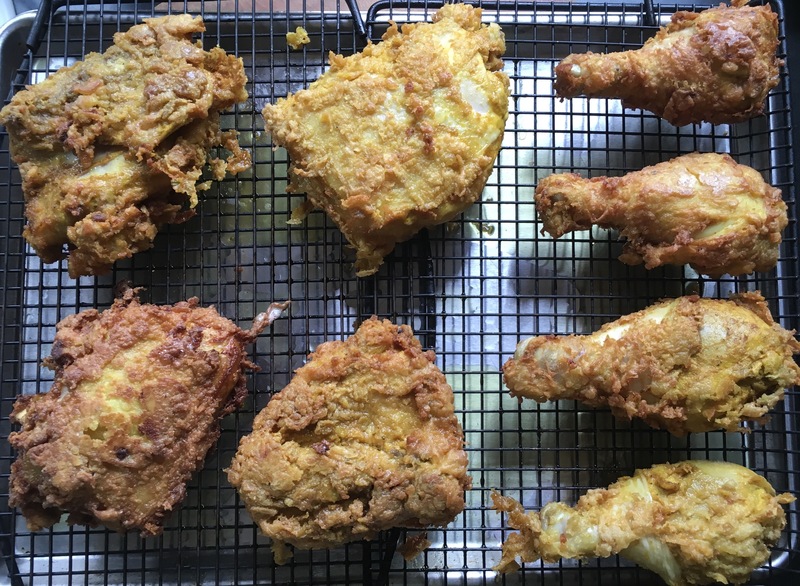 Since the pieces of chicken I used were rather large, I fried the chicken only to get a nice golden color on the outside. Then the meat went into the oven to finish cooking all the way through. This recipe requires marinating for a full 24 hours, so plan ahead! In a food processor or blender, combine the garlic, ginger, lemon, coriander, turmeric, cayenne, vegetable oil, 2 teaspoons of salt, and 1 teaspoon of pepper. Blend until smooth. 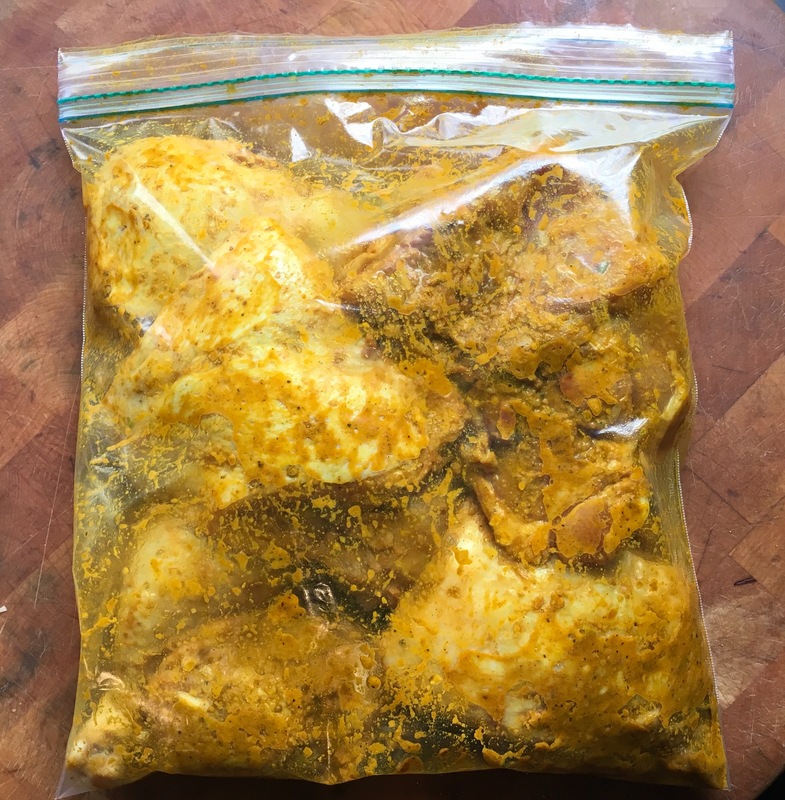 Place the Ziploc in the fridge and marinate the chicken for 12 hours. After 12 hours, add the yogurt to the bag, mixing well, and return it to the fridge for another 12 hours. Pre-heat the oven to 325 degrees. Set a rack over a rimmed baking sheet and set aside. In a bowl, combine the chickpea flour and 1 teaspoon of salt. 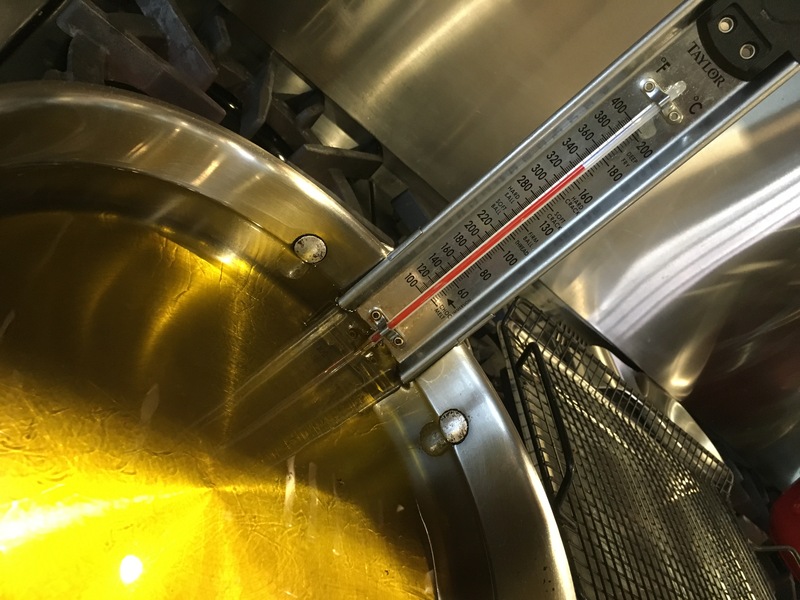 Meanwhile, in a large heavy saucepan, heat about 2″ of the oil to 325 degrees on a thermometer. 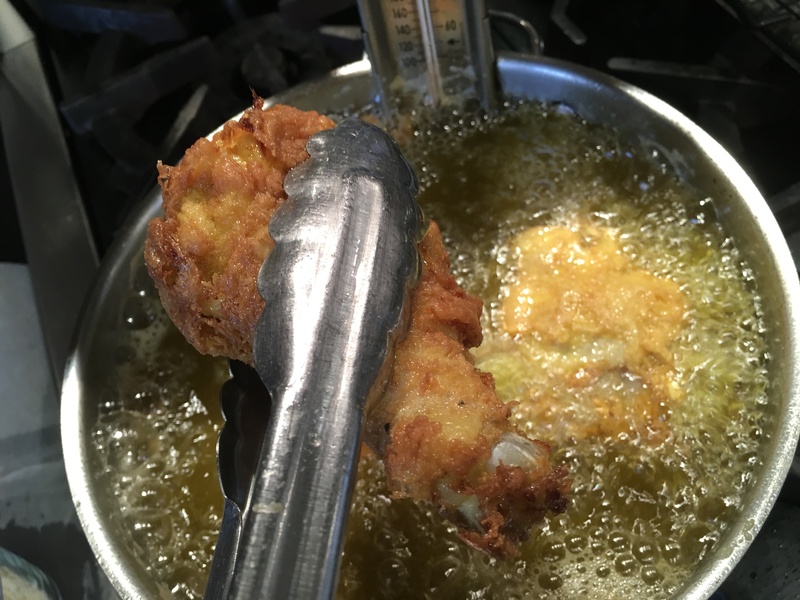 When the oil reaches the right temperature, take the pieces of chicken out of the bag one by one, letting the excess drip off back into the bag before dredging the chicken in the flour. Shake off the excess, and carefully place the chicken pieces in the hot oil, working in batches. Don’t overcrowd the pan. Fry the chicken until golden brown, flipping once. You don’t need to cook it all the way through, just to brown it nicely. Place the browned pieces on the baking sheet with the rack. 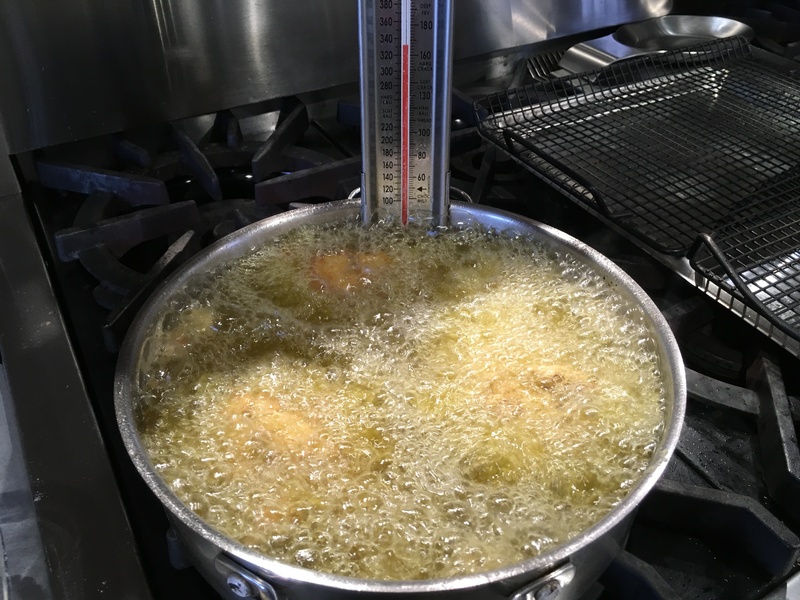 Once all the chicken has fried, place the baking sheet in the oven and cook the chicken until each piece registers about 160 degrees. 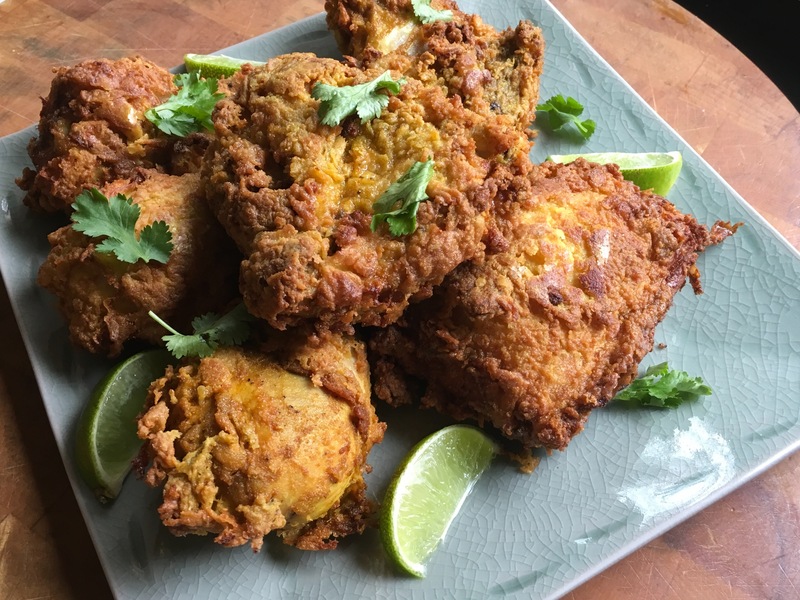 Place the chicken on a plate, then garnish with cilantro leaves and lime wedges. Chaat masala is a spice powder mix that typically contains dried mango powder, cumin, coriander, dried ginger, salt, black pepper, chili powder and more. It’s commonly used at the end of cooking a dish like this as a sprinkling on top. Since the only jar I could find contained 1/2 lb., way too much for my needs, I chose to leave it out. Despite that coriander is the seed of the cilantro plant, the two are not interchangeable in cooking. Coriander seed has a lemony essence when ground. Always good to have in the pantry.